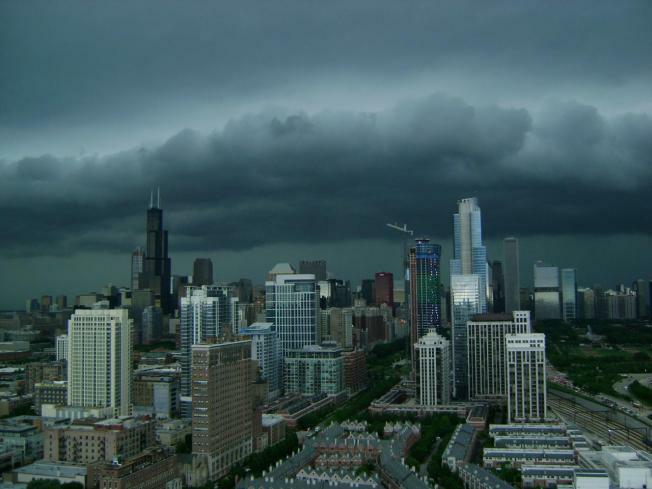 A pair of storms wreaked havoc on the city Friday. Chicago officials are now blaming some of the broken high-rise windows from last week's violent storms on the white pebbles deliberately spread on downtown roofs. Jose Santiago, director of Chicago's Office of Emergency Management, said Monday that the 77 mph winds that hit the city Friday afternoon picked up an unusual number of the pebbles and pelted them against window. At the 110-story Willis Tower, two windows were blown out in a 29th-floor air conditioning mechanical room and a 25th-floor unoccupied office. Windows were also broken on Washington and Randolph Streets. The pebbles are spread on the roofs to reflect sunlight and lessen the need for air conditioning inside the buildings.